Holiday season is here, and it’s time for celebration. Despite the notoriously harsh weather Chicago is known for, we don’t let it get us down – instead we thrive. There are lots of opportunities to celebrate the season in style this year, and a few first-time events are making their debut in 2015. These 5 events will keep your winter season exciting, and give you a reason to get in the holiday spirit! The Lincoln Park Zoo is one of Chicago’s great free attractions, and an ideal destination for the family this holiday season. 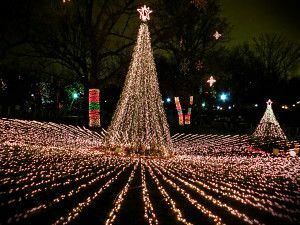 Along with exotic animals, beautiful gardens and the skyline of downtown Chicago as a backdrop, the Lincoln Park Zoo gets dressed up with festive lights and offers classic holiday activities. Lights go up November 27, and last until January 3rd. You can check the holiday schedule for details on specific events. What are some of these events? Not bad at all – Ice skating is $5 for admission and $5 for skate rentals. ZooLights Family Night is on Dec. 14, 21 and 28, and will include the Lionel Train Adventure, AT&T Endangered Species Carousel and Holiday Wagon for free. For the adult crowd, be sure to come out Wednesday, December 2 for the BrewLights celebration presented by Louis Glunz Beer. Sample a dozen craft beers among the thousands of holiday lights with your friends and spread the holiday cheer with holiday spirits. Robert Joffrey’s production of The Nutcracker is a landmark holiday tradition in Chicago. The Joffrey Ballet is a Chicago based company producing masterpiece work since 1956. This world class organization is the first dance company to perform at the White House, (invited by Jacqueline Kennedy herself), appeared on the cover of Time Magazine and had a major motion picture based on their story. This year will be the final season of The Nutcracker as choreographed by Gerald Arpino and Robert Joffrey, before it is reinvented by Christopher Wheeldon next year. If you are a Chicago local and have not seen it yet, this is a show you don’t want to miss. Get excited for this one, because 2015 will mark the first year of the Chi Town Rising NYE celebration. This epic concert will rival the “dropping of the ball” in NYC with some Chicago-style event action. This festival begins at 7pm with live music from Chicago’s hottest artists and DJ Sye Young spinning tracks all night to warm the crowd. The full music lineup has not been announced, but pressure is on because the expectations are set high. At 11pm NBC 5 and Telemundo will introduce Chicago with a live television broadcast featuring celebrity guests, A-list musical performances and a nostalgic recap of 2015. Like The Big Apple, we have our own “ball” to drop, but our “ball” is a star. This star will rise 360 feet into the Chicago skyline, and will conclude with an epic fireworks display. Though the complete lineup has not been announced, we know that the band American Authors will be kicking off the TV performance on the Chi-Town Rising Countdown Stage, followed by a performance from legendary rock band “Chicago.” Their midnight performance will celebrate the first year of what is likely to be a Chicago New Years tradition. Be part of history this New Years Eve, and celebrate Chicago Style with the first annual Chi Town Rising! Looking for a unique gift for family members and friends? The One Of A Kind Show And Sale is the perfect solution for you. This event will have handmade artisan crafts such as jewelry, art, clothing and more all created by local artists and craftsmen. This shopping experience includes gourmet cafes, a fashion show and live music. You won’t see that at the mall! This event has contributions from over 600 artists, and is the perfect place to pick up a one-of-a-kind gift you won’t find at a traditional store. This is a great opportunity to meet local artists, join a craft workshop and enjoy the jolly atmosphere. This event will take place at Merchandise Mart from December 3-6. Get there while you can, and get your loved ones the perfect holiday gift! 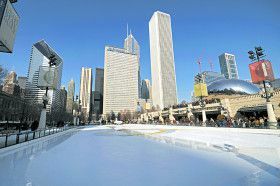 Most locals are familiar with this one, but it’s worth a mention because it is truly one of Chicago’s greatest winter activities – ice skating. This legendary ring draws in more than 100,000 skaters each year, and is free and open to the public all winter. Don’t know how to ice-skate? No worries! Come out Fridays, Saturdays and Sundays an hour before the rink officially opens for free skating lessons. Special programs including noodle hockey, speed demos and ice dancing will be open each day of Chicago Public School Winter Break (December 21-31) with the exception of Christmas day. The rink will be open November 3, 2015 – March 6, 2016. Skate rentals are $12 with tax, and locker rentals are available for only $1. Snacks and hot chocolate are available at the Park Grill Cafe, and this is the perfect destination for a date or family adventure. Come out and see why this skate rink has been a staple in Chicago winters for decades. Get the full schedule at the City of Chicago website. Chicago weather may seem daunting to some, but there’s no need to lock yourself indoors until the weather improves. These holiday activities will brighten up your winter and get you in the holiday spirit, so make the most of the season with these great opportunities to enjoy the time with your friends and family. Happy holidays from Gino’s East!